The problem is many people don’t know proper guest etiquette, so they feel uncomfortable having to make a decision about what to give. Remember that the size or price of the gift is insignificant. What you need to focus on instead is what that person will like. When you bring a food or drink gift to the host of a dinner party, don’t expect it to be served while you are there. Remember that this is a gift, not an accompaniment to the meal. If the hostess wants you to bring a dish to share, she will ask you during the invitation. Give it to her at the door so she can put it away before greeting other guests. If you are invited to a dinner party at a restaurant, it generally isn’t necessary to bring a hostess gift. However, if the host is footing the bill for the entire party, a gift will be much appreciated. You don’t have to match the price of the gift to the bill, but consider bringing something you might bring to a home dinner party. Holiday parties are perfect occasions to bring hostess gifts. The time of year lends itself to celebration through giving. As with any other host or hostess gift, keep your relationship with the recipient in mind when selecting the item. You wouldn't give your boss the same type of gift you'd give your best friend. A gift for a host or hostess who is kind enough to accommodate you overnight should be a step up from a dinner party gift. After all, more preparations will have to be made, including extra laundry, cleaning, and additional meals. You may include items you will use while staying there, but add something extra that the host or hostess can enjoy later. If you are invited to a housewarming party or open house, you should bring something suitable for the new residence. Try to find out the color scheme beforehand. You may also consider purchasing something in a neutral shade or style that will go with any décor. Basket filled with small items, such as coasters, soaps, pens, notepads, etc. 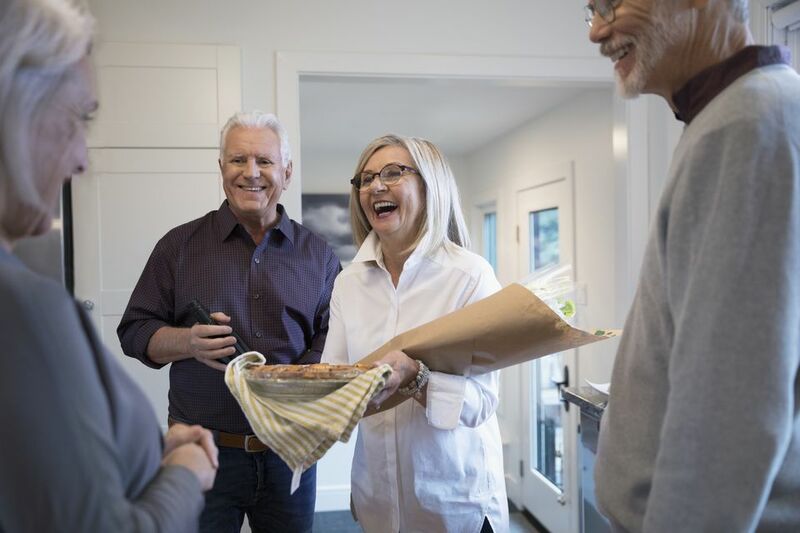 If you are visiting the home of your future in-laws, you can help alleviate a case of nervousness by arriving with a gift. Make sure you know their tastes to prevent the embarrassment of giving something inappropriate. As soon as possible after you return home, send a handwritten thank you note to the host or hostess. You will want to do this, even if you brought a gift. The note doesn’t have to be long, but it should be heartfelt. A simple show of gratitude is all that is necessary.